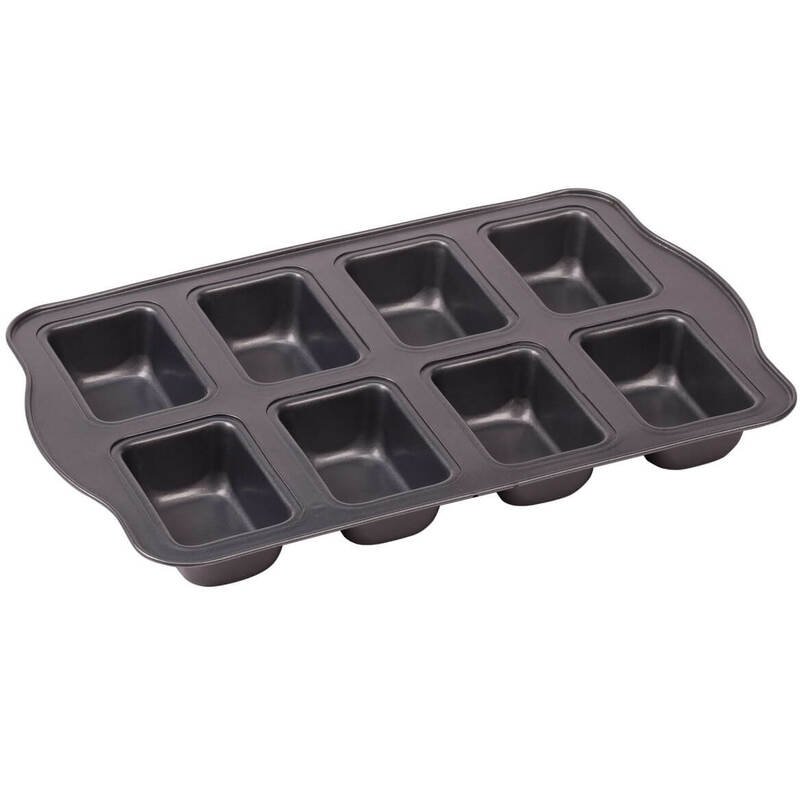 Baking eight mini loaves at once, this efficient mini loaf pan helps you and your oven work smarter! Creating uniform sweet breads, mini meat loaves, quiches, fruitcakes and more, the mini bread loaf pan promises quick, easy cleanup in dishwasher-safe, non-stick metal. 9 1/2″ x 13″ overall; each loaf is 2 1/2″ x 3 3/4″. 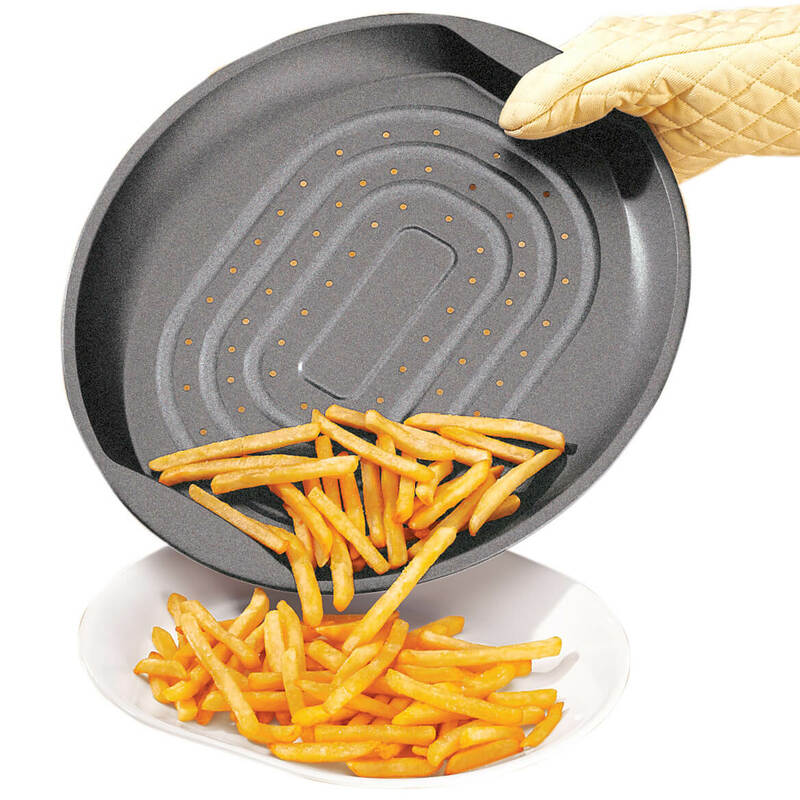 Treat your family to crispy, golden french fries, onion rings and more, baked to perfection without greasy deep-frying! The oven crisper pan has a special perforated design that evenly circulates and distributes heat for faster cooking without turning. Non-stick steel perforated pan is oven and dishwasher safe. 15 3/4″ long x 14″ wide x 1 1/4″ high. These smart Aluminum Crispy Crust Pie Plates feature unique mesh bottoms which allow uniform browning, so your pie crust “crisps up” to golden perfection every time! Eliminating soggy spots or undercooked mishaps, the classic 9″ dia. pie trays are your secret to flaky, crispy crust every time. Hand wash. Set of 2. This personalized cake pan with lid gives sweet credit to the baker! 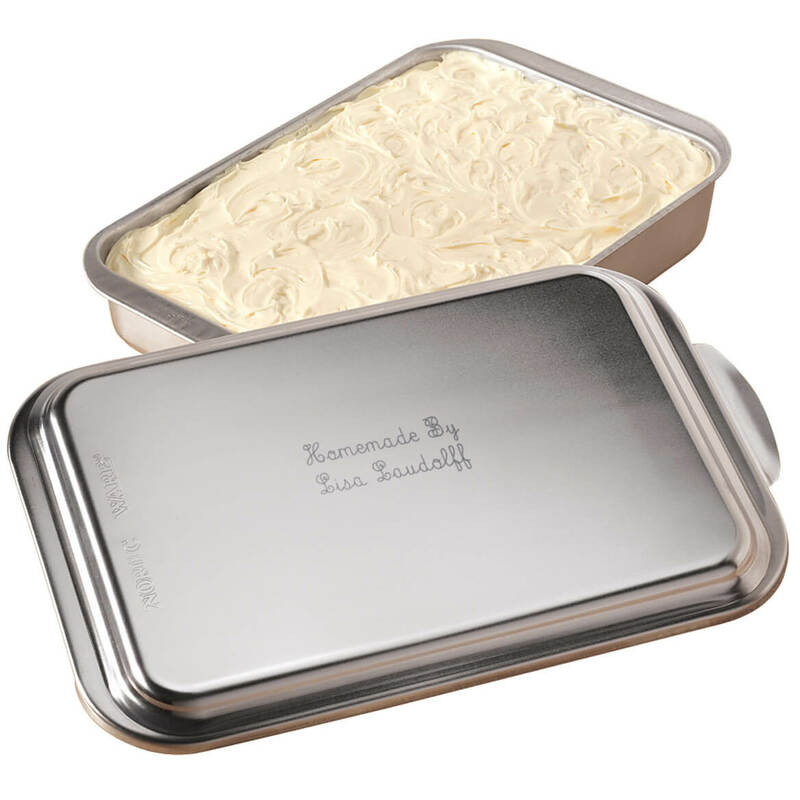 Our personalized cake pan is perfect for potlucks and bake sales, helping you leave with the right pan. 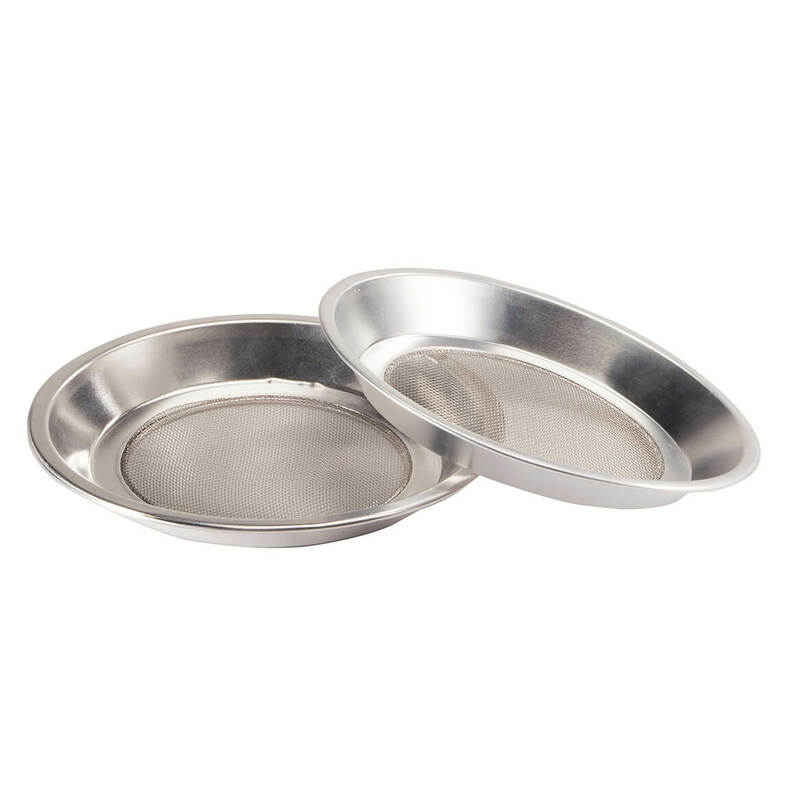 Specify name/message; limit 2 lines, 20 letters/spaces per line for each engraved cake pan. Rustproof aluminum. Hand wash. Personalized baking pan measures 13″ long x 9″ wide. Made in USA. 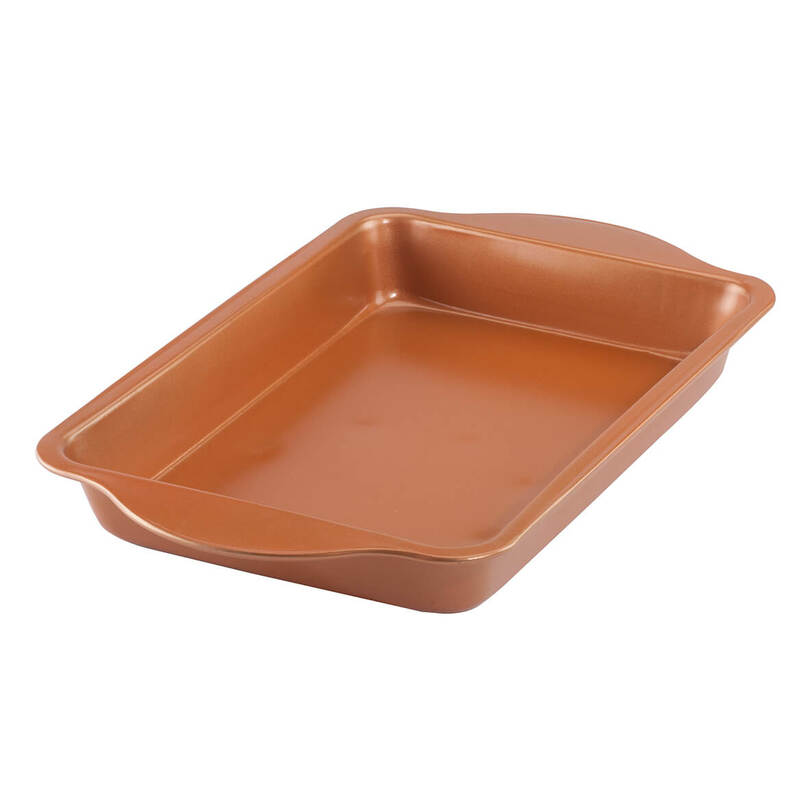 This versatile copper baking pan is crafted of heavy-gauge carbon steel with non-stick ceramic coating, assuring uniform heating, easy food release and effortless cleanup. Designed with side handles for easy transfer in and out of oven, the classic rectangular copper pan is perfect for baking a variety of foods—from cakes to brownies, roasted vegetables, baked chicken, casseroles and more. Dishwasher safe. Copper kitchenware measures 9″ x 13″ x 2″. 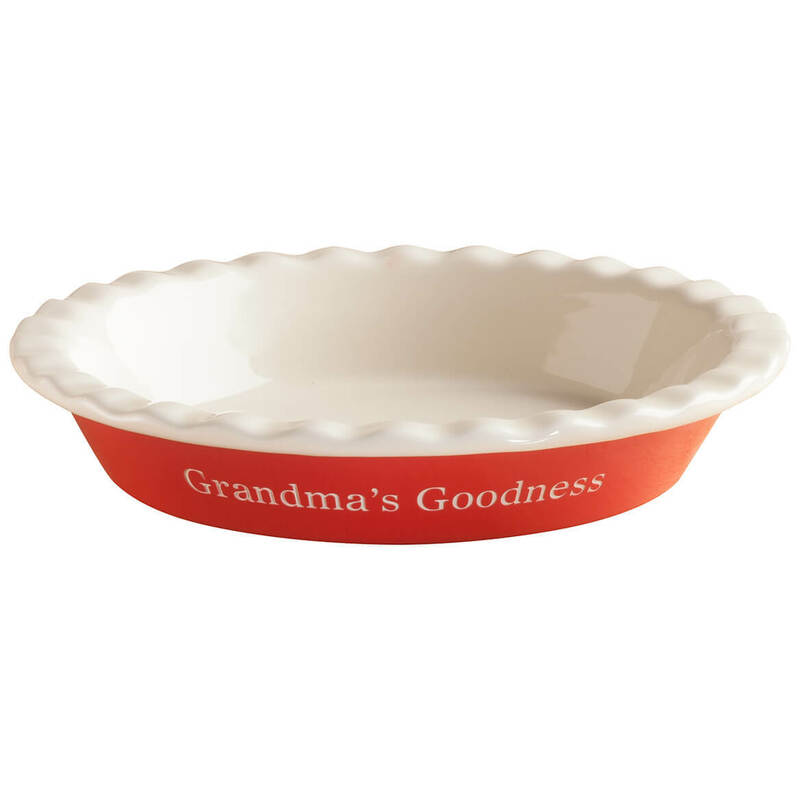 Baking and serving in elegant style, this Personalized Pie Dish makes a thoughtful gift for your favorite baker! Great for 8″ pies, cobblers, quiches and more, the ceramic pie dish offers even heat distribution for uniform results. Featuring glazed red exterior, cream interior and fluted, scalloped edges it goes from oven to table beautifully. We’ll personalize this ceramic pie pan with sand etching for lasting results, creating a custom gift for holidays, weddings, showers or any occasion. Specify name or message; limit 1 line, 20 letters/spaces or initial. Dishwasher- and microwave-safe. 9″ dia. x 2″ D.
Specially designed to promote even baking and browning of all your favorite foods, this versatile 3-piece copper baking set is constructed of heavy-gauge carbon steel with non-stick ceramic coating. Distributing heat quickly and evenly for consistent, uniform results, each copper cookware piece releases baked goods in perfect condition, then cleans up easily, right in the dishwasher! A staple for any kitchen, the set of 3 includes loaf pan (10″ x 4 1/4″ x 3″), baking sheet (15″ x 10″) and baking pan (9″ x 13″ x 2″). Specially made for one special cook, this Personalized Rectangular Baker is a gift that’s useful and truly thoughtful (especially when lovingly layered with your famous lasagna). 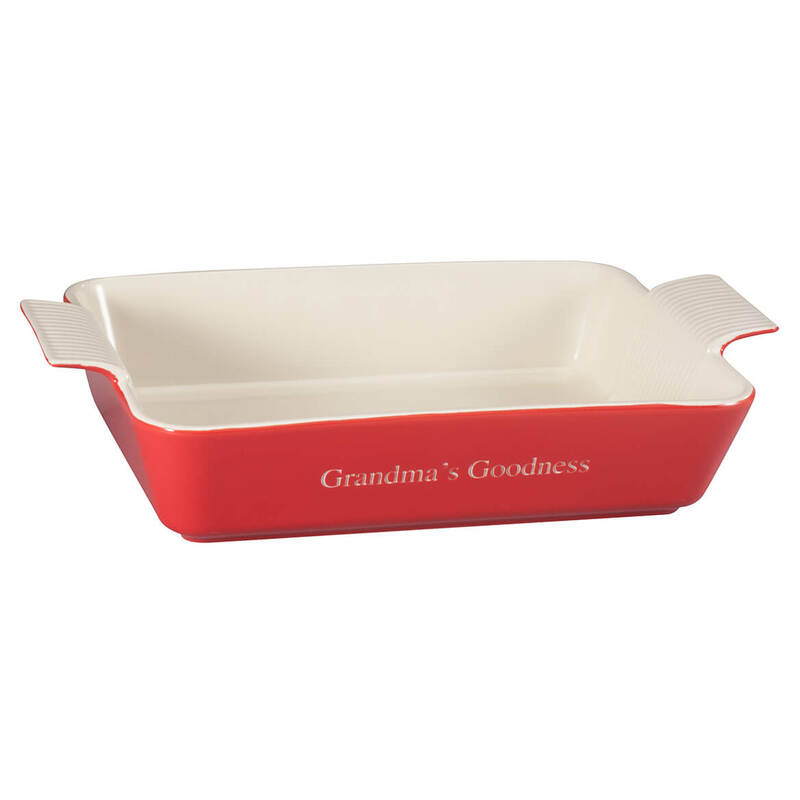 Featuring glazed red exterior and white interior with convenient side handles, the premium ceramic baking dish assures even heat distribution for delicious lasagna, casseroles, cobblers and more. Going from oven to table for stylish serving, this potluck hero becomes a cherished gift when sand etched with any name or custom sentiments. Specify name or message; limit 1 line, 20 letters/spaces. Dishwasher- and microwave-safe. Baking pan measures 11″ long x 8″ wide x 2 1/2″ deep. 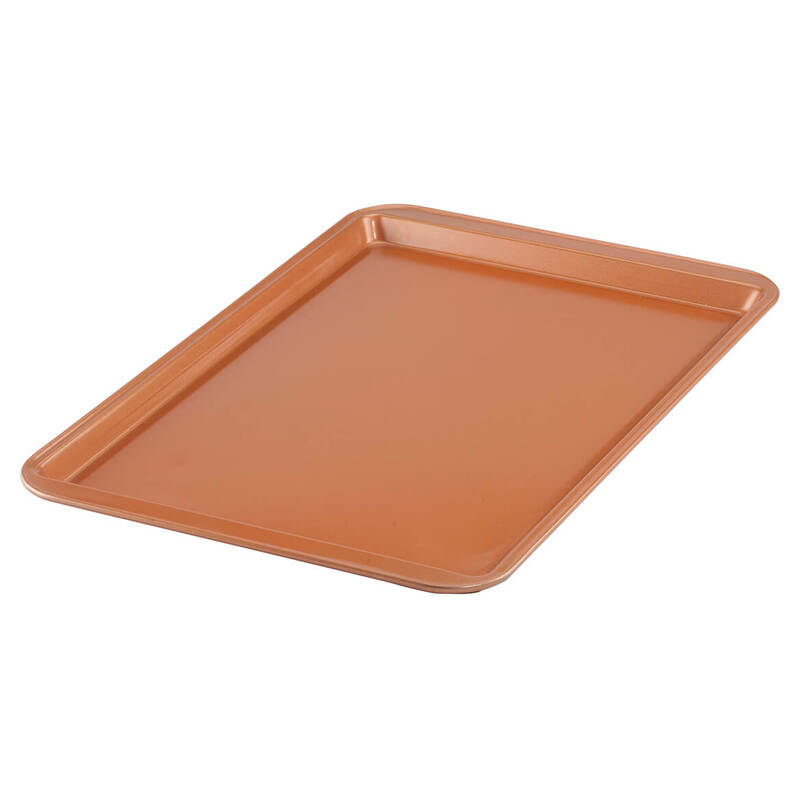 Evenly baking and browning cookies, pastries, fish sticks and more, this copper baking sheet is constructed of heavy-gauge carbon steel with non-stick ceramic coating—releasing foods intact and cleaning up in a snap. Great for a variety of baking tasks, the generous copper cookware’s surface distributes heat quickly and evenly, assuring uniform results. Raised sides allow sure grip when removing the sheet from the oven. Dishwasher safe. Copper kitchenware measures 15″ x 10″. 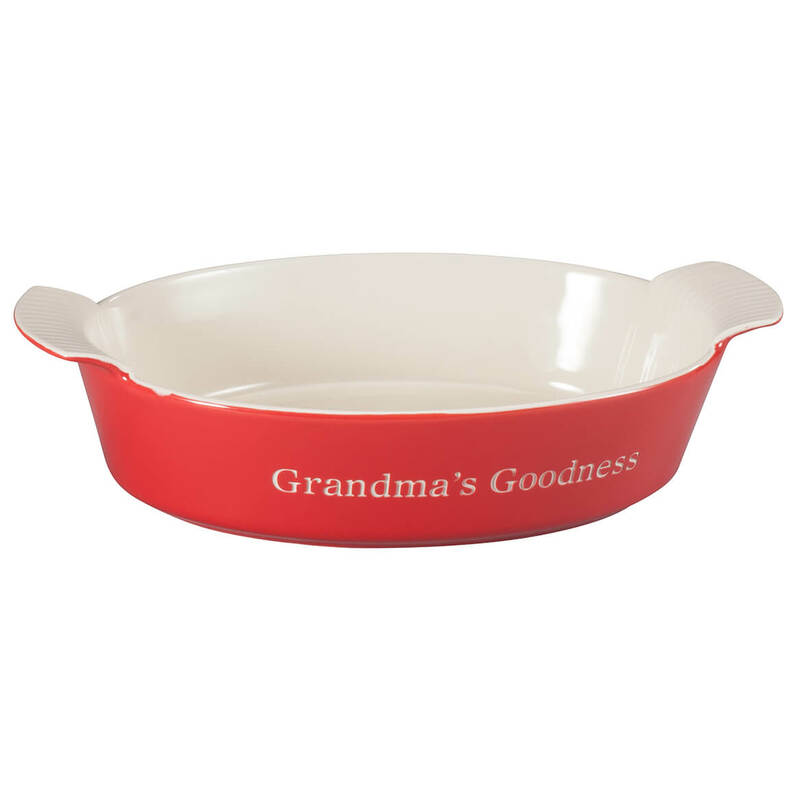 This all-purpose Personalized Oval Baker becomes a sentimental treasure when specially made for one lucky cook! The ultimate gift for holidays, housewarming parties, wedding showers and more, our stylish oval baking pan features glazed red exterior and white interior with sturdy side handles. 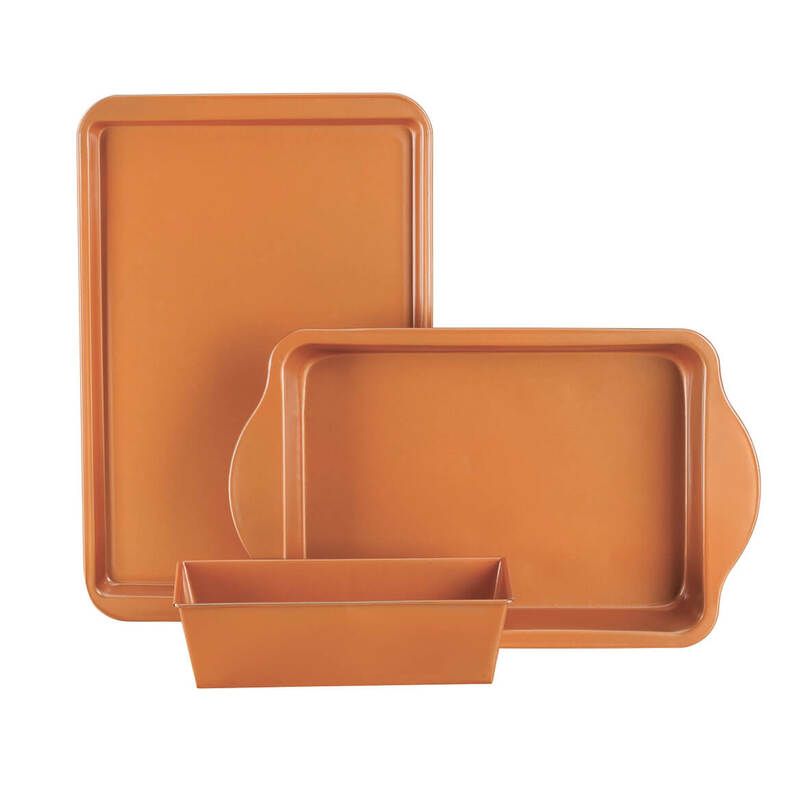 Extremely durable and versatile, the premium ceramic bakeware provides even heat distribution for uniform cooking of casseroles, desserts and more—going from oven to table or buffet in classic style. We’ll personalize this ceramic baking dish with sand etching for beautiful, lasting results (and easy identification at potlucks and dinner parties!). Specify name or message; limit 1 line, 20 letters/spaces. Dishwasher- and microwave-safe. 9″ long x 6 1/2″ wide x 2 1/2″ deep.